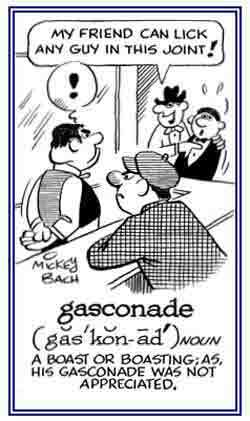 Idle talk; chatter, or glib speech: A good salesman usually has a gift of gab or very informal talking when he is trying to sell something. To jabber or to talk on and on about trivial matters: Lenora and Kyle gabbed for a long time about how they would spend their holidays. 1. A clumsy mistake or a breach of etiquette: Fred made a gaffe about Etta's new dress that embarrassed her. 2. A blundering social error; a "faux pas": Trisha realized that she had committed an embarrassing gaffe when she mispronounced the name of the diplomat's wife during the introduction. 3. 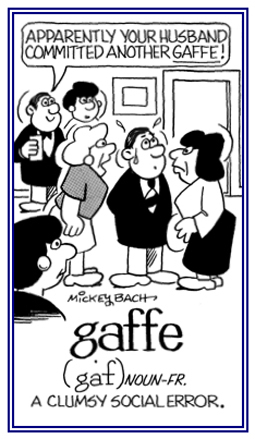 A blatant mistake or misjudgment: It is a serious gaffe to forget to lock one's house when he or she leaves home. A White House gaffe irritated diplomats who were forced to cool their heels. Several foreign diplomats were mistakenly denied entry to the White House when they arrived for an annual reception, and though most finally made it in, a few left in anger. Friday, October 8, 2010; page 10. 4. 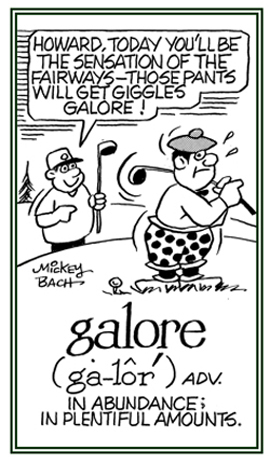 Etymology: the meaning of "blunder" is from about 1909, from French gaffe, "clumsy remark"; originally, "boat hook" from Old French gaffe, which came from Old Provençal gaf. © ALL rights are reserved. In large amounts or numbers: The department store is promising to have bargains galore during its weekend sales. 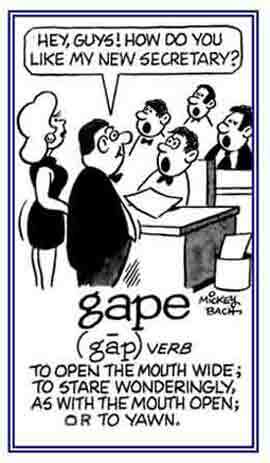 The term galore is always used after a noun, not in front of it. 1. A whole series or scale of musical notes: Before playing her favorite musical pieces on the piano, Pamela warmed up by playing a gamut of harmonics that her teacher gave her. 2. A complete or entire range of anything: Mary's feelings about the singing contest ran the gamut from hope to despair. 3. Etymology: Guido of Arezzo, an 11th-century musician and a monk, called the first line of his bass staff gamma and the first note in his scale ut, which meant that gamma ut was the note written on the first staff line. 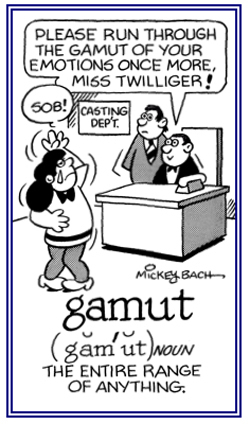 Over the years, gamma ut was shortened to gamut; however, the scale of its meaning expanded to cover "all the notes of Guido's musical scale", then "all the notes in the range of a musical instrument", and finally, "an entire range of anything". © ALL rights are reserved. 1. An opening in a solid structure or surface: Henry's dog wriggled through a gap in the fence at the backyard when it came back from snooping around. There was a large gap in the wall where the artillery shell exploded. 2. A pass or access through large steep hills: When Tim and his friends were exploring a geographic region, they were able to walk through a gap in the mountains so they could see what was on the other side. 3. A space between objects or points; an aperture: Shirley had an abnormal gap between her two front teeth. 4. A conspicuous difference or imbalance; a disparity: There was a big gap between Sue's income and her spending during the last month. 1. To stare at with an open mouth, as in wonder: At her birthday party, Becky suddenly gaped when she saw her high school friend whom she hadn’t seen for 10 years! 2. To involuntarily open the mouth wide, as the result of hunger, sleepiness, or absorbed attention: Greg was so sleepy after staying up for more than 24 hours, that he gaped, or yawned, right in front of some strangers! 3. To open or to become wide open: The curtains in the children's bedroom were gaped and so they could see the stars and the moon in the sky while they were in bed and before they fell asleep. 4. To open the oral cavity; especially, of feathered creatures: The baby birds were gaping as their mother thrust food into their beaks. © ALL rights are reserved. 1. 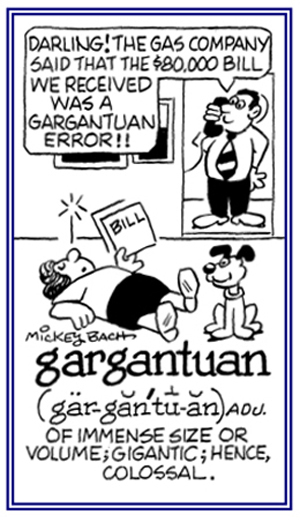 Anything that is described as huge, gigantic, vast, or of enormous proportions: The term gargantuan is derived from Gargantua who was a king and described as having a voracious appetite in a novel by the French author Francois Rabelais (1494-1553). Jack and Jill bought a gargantuan house with the money they inherited from her parents which consisted of at least twenty-five rooms. 2. 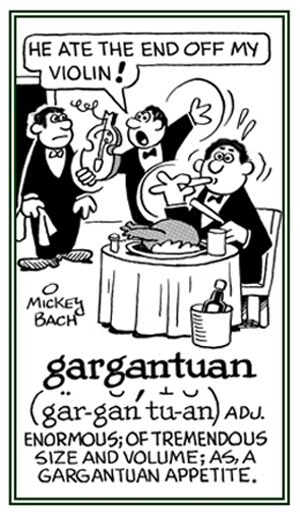 Etymology: derived from garganta, Spanish for "gullet" and French gargouille, "throat". © ALL rights are reserved. 1. A group of soldiers or military troops stationed in a fort, town, etc., to defend it: American troops are assigned to garrisons in other countries besides those that are in the United States. 2. Etymology: from Old French garison, "fortification"; formed from garir, "to defend"; ultimately from a prehistoric German word meaning "to protect". The sense of "fortress" and then of being a "detachment of troops" in a garrison developed in the 15th century. To provide a fort or base in or near a town with a military post and troops: Many U.S. soldiers and airmen are garrisoned in other nations with their families and special facilities; such as, libraries, food centers, schools, etc. Someone who boasts or brags about his or her achievements, ability to do something, or possessions: June didn’t like her neighbor who obviously was a gascon because he was always talking about his new car, his job as a well-paid manager, his beautiful wife, his intelligent children, etc. © ALL rights are reserved. Boastful talk or an overly exaggeration of claims: Joe's grandmother was always making a lot of gasconades about him whenever anyone asked her about how he was doing as a student in the university. © ALL rights are reserved. To boast excessively or to brag irrationally: Bryan was gasconading about how he would defeat his boxing opponent with one punch in the first round. 1. A reference to behaving in an awkward or inappropriate way in a social situation: Having forgotten how to curtsey properly, Marilyn had a very gauche feeling when she was presented to the hostess. 2. Conveying or showing a lack of awareness about the proper way to behave with other people: Others thought that Joe displayed his gauche attitude when he asled the older woman, whom he just met, how old she was. 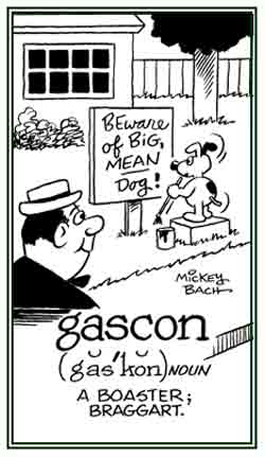 Mike showed his gauche behavior when he spoke to the president of the company as "Old Buddy". 3. 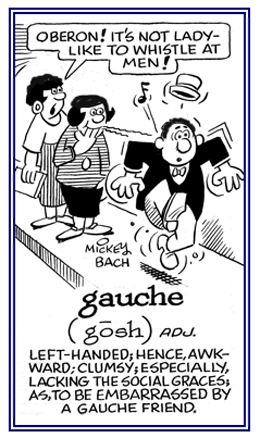 Etymology: "awkward, tactless"; from French gauche, "awkward, left-handed, left"; originally, "awkward, awry" from Middle French gauchir, "to turn aside, to swerve"; from Old French gaucher, "to trample, to reel, to walk clumsily". © ALL rights are reserved. 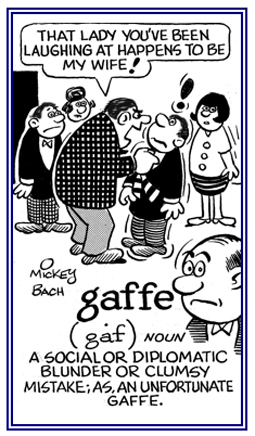 A descriptive term for being without social grace, sensitivity, or acuteness; awkward; crude; tactless: Sherry apologized for behaving gauchely at the concert last night and embarrassing her guest.